The HA source for the available fillers is either avian, found primarily in rooster combs, or bacteria-sourced, mainly from the synthetic fermentation of the Staphylococcus equine bacterium. The latter source has become more popular recently because of potential allergy to the avian source owing to a high avian protein content, and also because the bacterial-derived HA products are more pure, more viscous and not derived from an animal source. Restylane is a non-animal stabilized HA, known as NASHA, produced by the fermentation of equine streptococci. It is cross-linked with 1, 4-butanediol diacrylate (BDDA), with 1% degree of cross linking. Restylane has HA concentration of 20 mg/ml. Restylane has a particle size of 400microns and is most appropriate for mid-to-deep dermal injections; Perlane has a particle size of 1000 microns and is used for deep dermal or superficial subcutis injections. ,, We hereby present our experience of use of Restylane and Perlane in Indian patients for correction of nasolabial folds. 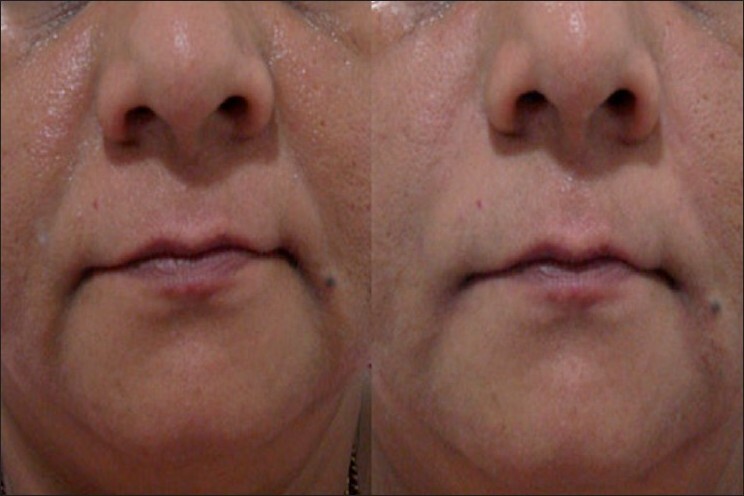 Thirty patients with Fitzpatrick phototype IV to VI were recruited in the study after informed consent for correction of bilateral nasolabial folds with NASHA fillers, Restylane and/or Perlane (Q-Med, Sweden). None of the patients were on drugs like aspirin, NSAID's, anticoagulants or herbal supplements that increase the risk of post injection bruising. Treatment was carried out under surface anesthesia. In all the 30 cases, topical anesthesia using lidocaine with prilocaine under occlusion was applied 60 minutes before procedure. Patients were placed in a sitting but relaxed position. Use of serial puncture, linear threading, fanning and layering techniques individually (Restylane or Perlane) or in combination for mid to deep dermal correction was employed. The most common technique used was linear threading; fanning was preferred at the base of the nasolabial fold. 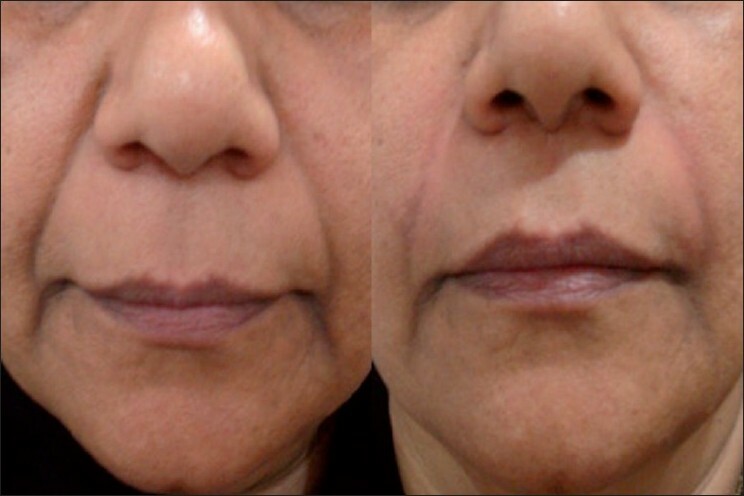 Layering with Perlane and Restylane was done for patients with severe nasolabial fold creases. Post-injection gentle molding of the filler in the fold was done by massaging through ultrasonic gel both externally and intraorally. After the procedure, patients were instructed to avoid exposure to heat or cold, physical exertion or further massaging of the area for 6 hours. Any adverse reactions were also noted and analysed. All patients were reviewed at 2 weeks interval for further touch up to obtain optimum correction. Safety and effectiveness was assessed by the physician at 3, 6 and 9 months post-injection. Clinical evaluation of persistence of correction with global assessment using Wrinkle assessment scale (WAS) was done. The physician and patient independently compared the preoperative photograph with the treated face and answered the question: "How would you describe the degree of improvement?" Possible responses were graded as follows: (1) very much improved (2) moderately improved (3) somewhat improved (4) mild improvement or (5) minimal improvement. Of the 30 cases, 22 were females and 8 were males. Most patients were in the age group of 45 to 55 years with the mean age being 52 years. The youngest patient was 38 years and the oldest was 68 years old [Table 1]. Of the 30 cases, 16.6 % had mild, 53.33% had moderate and 30.07% had severe nasolabial fold lines. Restylane was used in 15 patients, Perlane was used in 10 patients and Restylane with Perlane in 5 patients [Figure 1],[Figure 2],[Figure 3],[Figure 4],[Figure 5],[Figure 6]. The volume needed for bilateral correction was as follows: Restylane® mean 1.0 ml (range 0.3-2.8 ml), Perlane® mean 1.0 ml (range 0.5-2.0 ml). 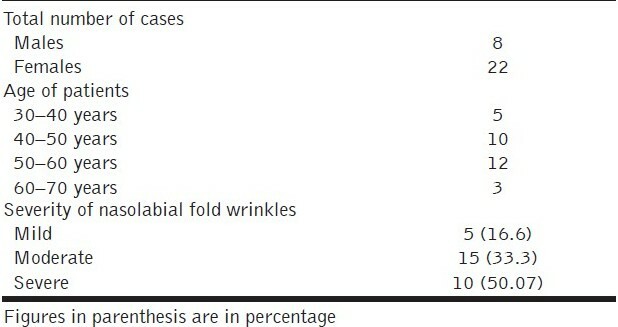 At 2 weeks after injection, assessment by the investigator revealed 100% correction for patients who had mild folds, >80% correction of the moderate folds and severe nasolabial wrinkles [Table 2]. Of the 30 patients, 8 (26.6%) patients needed a touch up at 2 weeks. At 3 months post-baseline, the investigator noted persistence of correction as >80% for all patients. 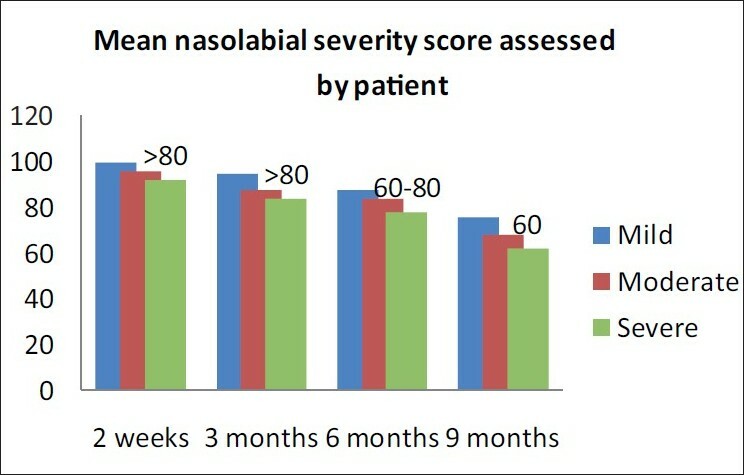 At 6 months post-injection, >80% persistence of correction was seen in patients with mild folds and 60 - 80% persistence for moderate and severe degree of nasolabial folds, as noted by the investigator. At 9 months post-injection, maintenance of correction was noted by investigator as 60 - 80% in patients with mild folds and moderate folds, and 40-60% in patients with deeper folds [Figure 7]. 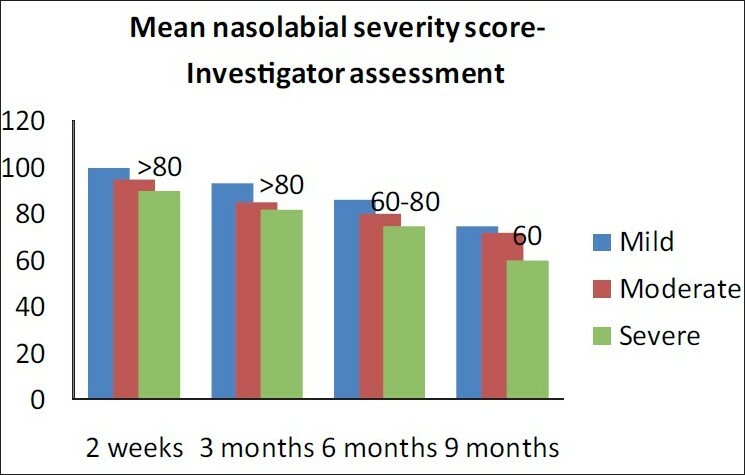 The patients independently assessed the persistence of correction and reported marginally better persistence of correction than those reported by the investigator [Figure 7] and [Figure 8]. 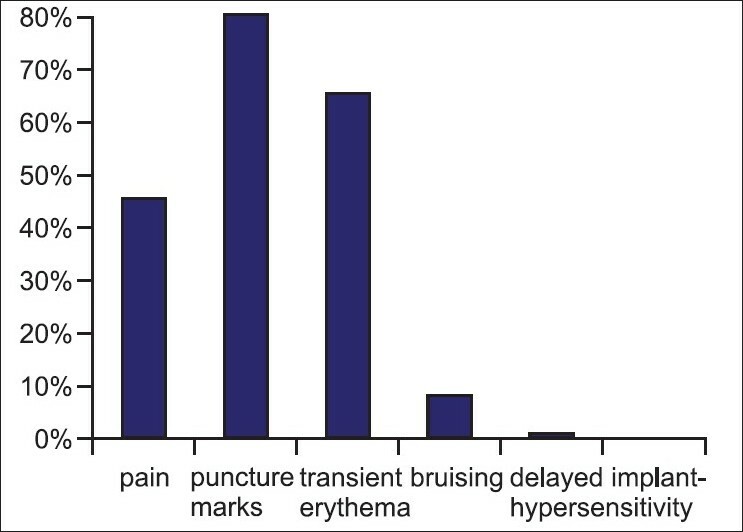 Transient post-injection effects like erythema at puncture site, needle marks were noted in 80% patients and bruising was seen in 8% patients [Figure 9]. No delayed hypersensitivity was seen in any patient. No hypertrophic scarring or keloidal formation was seen. 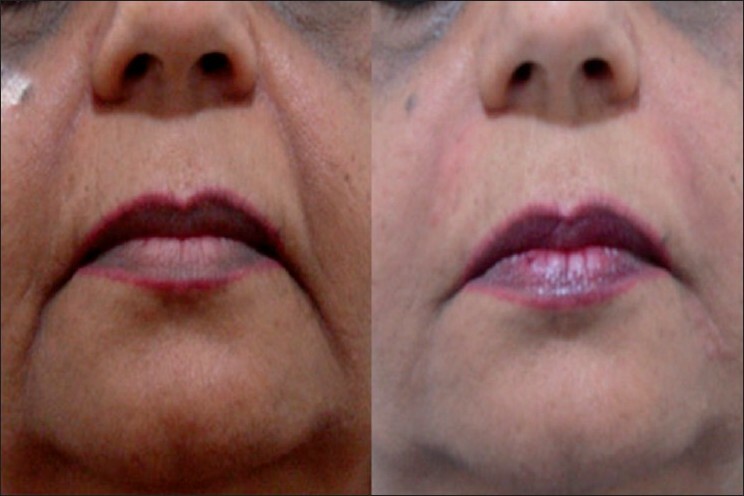 In this study we investigated the safety and efficacy of Restylane and Perlane in the correction of nasolabial folds in Indian patients. Restylane and Perlane were chosen because of their easy availability in India and global reports on their safety and effectiveness. In all patients optimal correction was achieved. 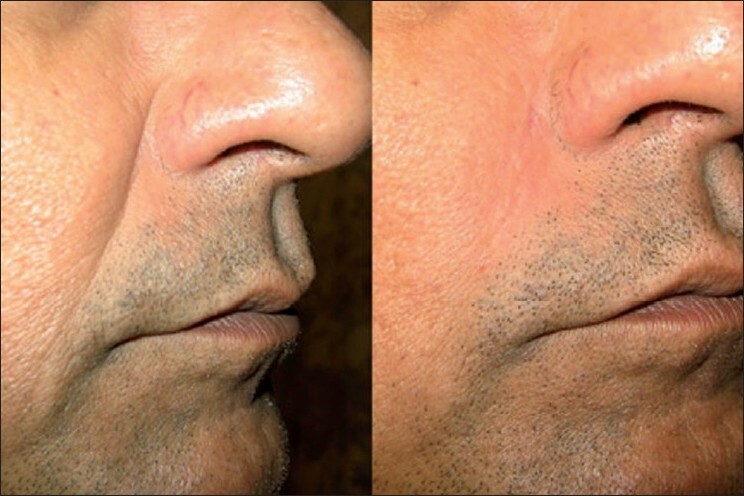 The efficacy of this augmentation persisted with time and was greatest at 3 months after the last treatment. Duration of the correction was evaluated; WAS showing grade 2-3 persistence of improvement at 9 months. Persistence of correction was more in younger individuals (aged 45-50 years) as they had mild folds than the elderly patients who had moderate to deep folds. Sustained result was seen in all patients upto 6 months and in some patients upto 9 months. There is some evidence suggesting that HA fillers may stimulate de novo collagen synthesis in the skin,  enhancing its properties as a filler. In a study by Wang et al., eleven patients received 3 intradermal injections of Restylane into photo damaged forearm on one side and saline into the other forearm. Punch biopsy samples were obtained at 4 and 14 weeks after injection, and collagen synthesis was assessed using immunohistochemical analysis, polymerase chain reaction and electron microscopy. There was significantly more type 1 collagen formation at the HA injection site. Authors thereby postulated that mechanical stretching of fibroblasts by the HA induced collagen production. This could explain why patients often report improvements in their appearance up to 12 months after receiving HA fillers. Thus Restylane® has been used for the past several years by numerous injectors with acceptable clinical results. Restylane® does last longer with most of the above studies indicating correction can be maintained from 6 to 12 months. More recent studies by Narins and Pinsky et al., have validated the long term persistence of correction upto 9 months. A comparison of results in different studies (including the present study) is shown in [Table 3]. Restylane and Perlane are safe and effective temporary methods to correct moderate to severe nasolabial creases and offers immediate effect, good product longevity and patient satisfaction for Indian patients. 1. Narins RS, Bowman PH. Injectable skin fillers. Clin Plast Surg 2005;32:151-62. 2. Narins R, Brandt FS, Lorenc ZP, Maas CS, Monheit GD, Smith SR, et al. A randomized multicenter study of safety and efficacy of dermicol P35 and non animal stabilized hyaluronic acid gel for correction of nasolabial folds. Dermatol Surg 2007;33:13-21. 3. Brandt FS, Cazzaniga A. Hyaluronic acid gel fillers in management of aging face. Clin Interv Aging 2008;3:153-9. 4. 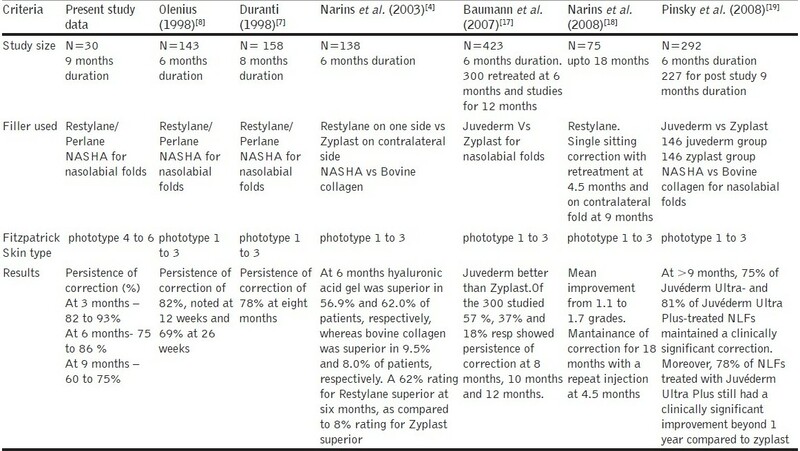 Narins RS, Brandt F, Leyden J, Lorenc ZP, Rubin M, Smith S. A randomized, double-blind, multicenter comparison of the efficacy and tolerability of Restylane versus Zyplast for the correction of nasolabial folds. Dermatol Surg 2003;29:588-95. 5. Falcone SJ, Berg RA. Crosslinked hyaluronic acid dermal fillers: a comparison of rheological properties. J Biomed Mater Res A 2008;87:264-71. 6. Tezel A, Fredrickson GH. The science of hyaluronic acid dermal fillers. J Cosmet Laser Ther 2008;10:35-42. 7. Duranti F, Salti G, Bovani B, Calandra M, Rosati ML. Injectable hyaluronic acid gel for soft tissue augmentation. A clinical and histological study. Dermatol Surg 1998;24:1317-25. 8. Olenius M. The first clinical study using a new biodegradable implant for the treatment of the lips, wrinkles, and folds. Aesthetic Plast Surg 1998;22:97-101. 9. Carruthers A, Carey W, De Lorenzi C, Remington K, Schachter D, Sapra S. Randomized, Double - Blind Comparision of the efficacy of two Hyaluronic acid derivatives, RESTYLANE perlane and Hylaform, in the treatment of Nasolabial Folds. Dermatol Surg 2005;31:1591-8. 10. Dover JS, Rubin MG, Bhatia AC. Review of the efficacy, durability, and safety data of two nonanimal stabilized hyaluronic acid fillers from a prospective, randomized, comparative, multicenter study. Dermatol Surg 2009;35:322-31. 11. Wang F, Garza LA, Kang S, Varani J, Orringer JS, Fisher GJ, et al. In vivo stimulation of de novo collagen production caused by cross-linked hyaluronic acid dermal filler injections in photodamaged human skin. Arch Dermatol 2007;143:155-63. 12. Alam M, Dover JS. Management of complications and sequelae with temporary injectable fillers. Plast Reconstr Surg 2007;120:98S-105S. 13. Moers-Carpi M, Vogt S, Santos BM, Planas J, Vallve SR, Howell DJ. A multicenter, randomized trial comparing calcium hydroxylapatite to two hyaluronic acids for treatment of nasolabial folds. Dermatol Surg 2007;33:S144-51. 14. Schanz S, Schippert W, Ulmer A, Rassner G, Fierlbeck G. Arterial embolisation caused by injection of hyaluronic acid (Restylane). Br J Dermatol 2002;146:928-9. 15. Vedamurthy M; IADVL Dermatosurgery task Force. Standard guidelines for the use of dermal fillers. Indian J Dermatol Venereol Leprol 2008;74:S23-7. 16. Odunze M, Cohn A, Few JW. Restylane and people of color. Plast Reconstr Surg 2007;120:2011-6. 17. Baumann LS, Shamban AT, Lupo MP, Monheit GD, Thomas JA, Murphy DK et al. Comparision of smooth gel hyaluronic acid dermal fillers with cross linked bovine collagen: A multicenter, double masked, randomized, within- subject study. Dermatol Surg 2007;33:128-35. 18. Narins RS, Dayan SH, Brandt FS, Baldwin EK.Persistence and improvement of nasolabial fold correction with nonanimal-stabilized hyaluronic acid 100,000 gel particles/ml filler on two retreatment schedules: Results up to 18 months on two treatment schedule. Dermatol Surg 2008;34:S2-8. 19. Pinsky MA, Thomas JA, Murphy DK, Walker PS; Juvιderm vs. Zyplast Nasolabial Fold Study Group. Juvιderm injectable gel: a multicenter, double-blind, randomized study of safety and effectiveness. Aesthet Surg J 2008;28:596-7.